I can't believe I'm having to write about guns again, a mere four months after the slaughter in the movie theater in Colorado. I am writing this three days after a disturbed young man forced his way into an elementary school in Connecticut and riddled the bodies of 20 children and six adults with bullets from a "Bushmaster" semiautomatic rifle. There's no end to the sorrow and the insanity in the Connecticut killings, nor in the nation as a whole. Many are asking the same question I asked myself all weekend: What kind of country allows the private ownership of powerful assault weapons? In this case, the owner was a gun "enthusiast" mom who couldn't be bothered to safekeep her weapons from her obviously troubled son. I don't mean to sound harsh, but since the kid was obviously incapable of common sense, it behooved Mom, to say the least, to make sure he couldn't get to the prize Bushmaster. Common sense wasn't just lacking in that one household, however. 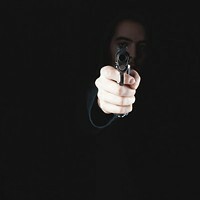 It's been missing for some time from our national discussion of firearms, which is in dire need of some baseline reality and rational thinking. Hopefully, more common sense about firearms will finally arise out of the murk of grief and anger over these 20 martyred children. Who knows? This country is nothing if not unpredictable, but maybe some combination of reason and gumption will spread through the nation, at least enough to reverse our national dysfunction. I'd like to think that such a change can still happen. And no, you can't call it anything but dysfunction when a country accepts mass murders by heavily armed nuts as a normal part of its national experience. If you think I'm exaggerating America's dysfunction on this deadly issue, consider that the vast majority of the world's worst mass killings have taken place in the U.S. Or that six of the 12 worst mass shootings in U.S. history have come in the past five years. Or that on the same day as the Connecticut massacre, a teenager in Oklahoma was arrested for plotting to bomb and shoot students in a school auditorium. Or that, two days later, an Indiana man with 47 guns was arrested for threatening to slaughter people at a local elementary school. Or that, on that same day, NBC's Meet The Press could not get one single pro-gun senator to come on the show to discuss the Connecticut massacre. Our guns dysfunction has been in play ever since the National Rifle Association — formerly a respectable organization of hunters and sportsmen — went off the deep end three decades ago and began targeting any politician that ever voted for even minuscule forms of gun control. The NRA today is run by a bunch of exploitive bullshitters, led by professional loon Wayne LaPierre, who stays rich by scaring the hell out of its members. The NRA repeatedly tells members that the big bad government is hellbent on taking their guns (with the help of the U.N., of course) and that any gun control is a definitive first step in the government's ploy to ban the private ownership of firearms. 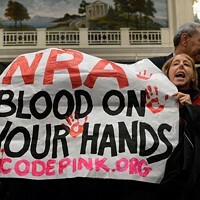 Sadly, enough NRA members, though certainly not all, fall for LaPierre's paranoid ravings to keep him sitting pretty. With any luck, this recent replay of our ongoing national tragedy of mass slaughters will be the beginning of the end of LaPierre's influence in our country. There is no rational reason not to tighten regulations on firearms, and there's no reason it can't be done without trampling the Second Amendment. When the Supreme Court ruled in 2010 that the amendment does imply an individual right to bear arms, it also left plenty of room for governments to regulate firearms. As Alternet's Joshua Holland pointed out over the weekend, most gun owners are reasonable and responsible; it's our discourse, twisted by LaPierre & Co., that isn't. So let's start a rational, responsible discussion about regulating firearms. Regulations that would include gun registration laws; a ban on assault weapons, which serve no reasonable hunting purposes; a ban on high-capacity ammunition clips; greater firearms proficiency requirements for gun buyers; raised penalties for crimes committed while using firearms; and regulation of the storage of weapons. OldJackPine, an avid hunter and regular contributor to liberal websites, noted late last Friday that there are European countries who have much stricter regulations on guns but still manage to maintain "rich hunting traditions." No one is going to propose banning private ownership of guns, nor would that be possible in the U.S. And it's probably not possible to keep some wacko from getting a gun if he is determined enough. But, to quote OldJackPine again, "for the sake of these victims there have to be ways to make tragedies like the one in Connecticut less likely."